Johnny Bobbitt Jr., a homeless veteran who gave his last $20 to a stranded motorist last month, has now purchased a new home and a 1999 Ford Ranger thanks to money raised by the woman he helped. Kate McClure was stranded and alone on the side of I-95 one night in Philadelphia after running out of gas. 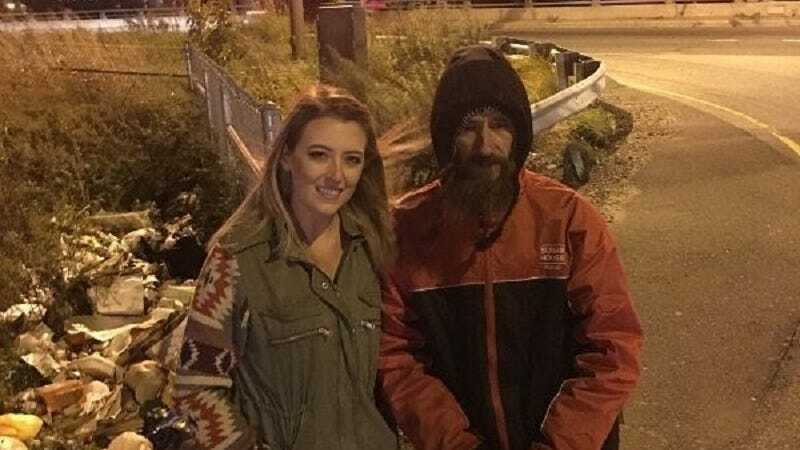 After pulling off to the side of the road, McClure was approached by Johnny Bobbitt Jr., a homeless man, who instructed her to stay in her locked car while he walked several blocks and spent the only cash he had on him to get her gas. Bobbitt Jr. served in the U.S. Marine Corps and worked as a paramedic before becoming homeless, as he says, through bad decisions and circumstance, according to the Associated Press (via TIME). McClure was unable to repay him at the time, instead deciding to set up a GoFundMe campaign for Bobbitt Jr. with the target goal of $10,000 to put toward an apartment. The campaign went viral and raised nearly $389,000 in 25 days, instead. The money will now go into two trust funds, one that will deposit money to a bank account every month for Johnny to use, and another that serves as a retirement account. Bobbitt Jr. has purchased a house, a computer and a truck, and wants to donate to people and groups that have helped him in the past, according to updates to the GoFundMe page. The GoFundMe features plenty of photos from Johnny’s past life, as well as his new one if you’d like to check it out and feel a little better about the world.